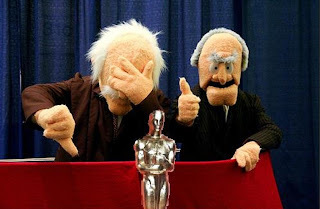 Cam's Cinematic Episodes: Epi-Cast: Episode 33 - "An Oscarmoron"
Move over Weinstein, the Oscar season isn't all about you! And, as a reminder of that indisputable fact, Cam and Tom have emerged from deep deep cover to toss out another hot digital joint for y'alls. Want to know who our hosts think will win Best Animated Feature?! Well, strap yourself in because you are in for one wild, bumpy,senses-shaking ride! With the Academy Awards just under a week away (contrary to what one of the illustrious hosts states in this very episode), the diligent duo go toe-to-toe with Oscar queen Meryl Streep's The Iron Lady. Are Cam and/or Tom sick of biopics? Only one way to find out! Well, okay, that's not quite true. But there's only one way other than scanning Cam's recent reviews! In addition to the main course, Cam tells you whether Safe House or Chronicle are worth your $10, while Tom classes up the 'cast with eloquent critiques of Anonymous and Tinker Tailor Soldier Spy. And, if that's not enough wonder to satiate you, the two also debate the merits of recent trailers for The Amazing Spider-Man, Jack the Giant Killer and The Bourne Legacy, as well as offer up their choices for who should win at this year's Oscars. So plug in, chill out and let loose, cyber-brothers and sisters! P.S. We are, of course, available on iTunes! Simply do a store search for "Epi-Cast" and, WRECKER-MYSTERIO!, you can subscribe to our feed and receive instantaneous downloads whenever we bother to upload a new episode. Oh, and we are the "Epi-Cast", not the "Epicast." It's very unlikely that insightful interpretations of the Bible will be included amongst our heated ramblings.